Medium (8-10) - $41.99 Only 1 left! The most tragic mistake the mortal world can make is coming to silly conclusions about the supernatural world. It lets us look at film or common convention and assume that one mystical monster is vulnerable to this or that while another wolfy werebeast can be warded off by the scent of something foul. Mortals can then wander into the darkness, full of confidence that they know everything to be said about the world of darkness… only to never return! Prime example is in the Vampire Lord. A mighty man of mysterious power who can look into your eyes and command you to do all that he wants. He might take the form of a bat or wolf at his whim or even puff into mist to sneak his way into your home. Oh, no, he couldn’t do that until he was invited and, even then, a simple ward of garlic and you’re safe, right? Oh, and how your little lass is laughing at all those silly thoughts! 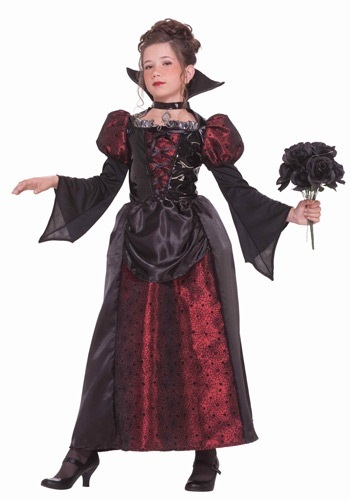 You both know better because she’s sweetly charmed you into picking up this Girl’s Vampire Miss costume. Who knew that the most skilled vampires of the world weren’t Lords at all, but little ladies!? With this lovely red taffeta base dress, your lass is already in lovely style. But, the spidery black décor spread throughout and the lace-designed vest, sleeves, and outer skirt show the mystery that hides behind this young lady’s eyes. Pure elegance at such a young age… at least, we assume. Perhaps she’s been doing this for ages!